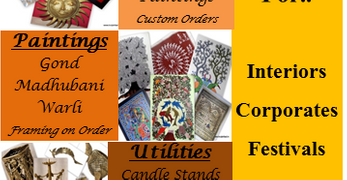 In our Decor and gifting line we have range of handcrafted Product line includes Metal artifacts, Eco friendly decor, Traditional Paintings, Wall decors and utilities and so on. In Custom Interior line we undertake many custom interior project like, customized doors/ windows, Brass Sculptures, Tribal/folk art on the wall, Wall Decors and so on, all handcrafted or handpainted by these artisans. In our dedicated corporate & social gifting line have customized art infused Mementos, trophies & Awards, Conference folders, office utilities and so on; complete with branding and packaging.